Abstract : Shouldering the responsibility of setting national benchmarks in seeking ecological progress, east China's Jiangxi Province, one of the first three national ecological civilization pilot zones in China, is striving to create a better eco-environment. In 2016, east China's Jiangxi Province was named one of the first three national ecological civilization pilot zones in China. The next year, China's central authorities approved the implementation plan for national ecological civilization pilot zone in Jiangxi. Jiangxi has established a property rights system for natural resources assets. In October 2017, Xinjian District of Nanchang City, Lushan City, Guixi City, Gao'an City and Nancheng County of Fuzhou City began to register property rights of natural resources including Ganjiang River, Poyang Lake, Lushan Mountain and Longhu Mountain. "Unlike in the past, we now know exactly about the types as well as conservation scope and measures of natural resources in wetland reserves," said Cheng Changfeng, deputy director-general of Xinjian branch of Nanchang Municipal Bureau of Land and Resources. Liu Bing, deputy director of Jiangxi Provincial Leading Group Office for Ecological Progress, said that the ownership registration put an end to the dispute on ecological resources, which laid the groundwork for building an ecological civilization governance system. Jiangxi never slackens it efforts in system construction, the key to improve the governance ability in ecological civilization. In land exploitation and protection, integrated watershed management, and ecological protection and restoration, Jiangxi has yielded 20 institutional outcomes and will reap another 9 this year. 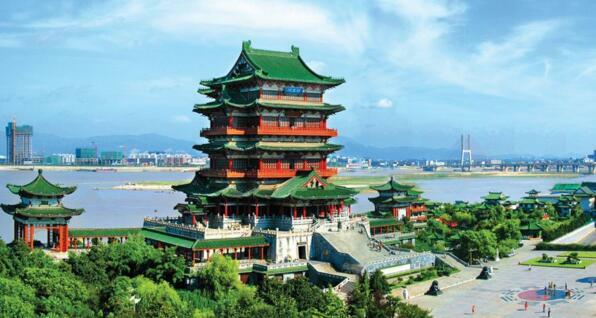 Green ecology brings Jiangxi the greatest wealth. Holding to the concept that lucid waters and lush mountains are invaluable assets, Jiangxi has been attempting to generate economic value from ecological environment. Fresh air in Fuzhou, a pilot city of national eco-products value realization mechanism, can fetch a good price. In last June, the green ecological forest carbon sink project in Aoxi Village, Le'an County of Fuzhou City, sold 21,000 metric tonnes (tonnes) of CO2-reduced air at a price of 15 yuan per ton, equivalent to the price of 11.5 tons of local tap water. Currently, five counties in Fuzhou have developed such carbon sink projects. Eleven villages and towns under the jurisdiction of Jing'an, a county in Jiangxi with picturesque ecotope and a forest coverage rate of 84.1 percent, are state-level ecological villages and towns. The reporter learned from his visit in Jing'an that the county, with strong efforts in governing mountains and waters, has seen tangible and incredible ecological progress. With big data, great wisdom and massive health industries flourishing in recent years, health and tourism projects are coming in succession to the county. "The ecological economy of Jing'an is ushering in the leapfrog growth," said Yan Xuhui, head of Jing'an County. Last year, the county attracted a total of 7.57 million tourists and achieved consolidated revenue of 4.42 billion yuan, both of which saw an increase of over 40 percent. Currently, of the total land area of Jiangxi, 65 percent is forestland (10.8 million hectares), 5.45 percent is wetland (910,000 hectares) and 63.1 percent is covered by forest vegetation. The percentage of days with good air quality in city proper keeps at 83.9 percent, and 92 percent of its cross-section water of outbound rivers reaches the state-assessed superior quality. What economic benefits can Jiangxi get from green mountains and clear waters? On May 30 this year, Jiangxi held a press conference and publicized its ecological income that had taken two years to evaluate. In 2016, Jiangxi's forests and wetlands brought fat ecological, economic and social benefits, reaching 1086.7 billion yuan, 314.5 billion yuan and 93.8 billion yuan respectively. Compared with the evaluation result of 2011, the ecological benefits of forests alone increased by 186.322 billion yuan, a growth of 23 percent.